John Scott Harrison, born October 4th, 1804, bears the unique distinction of having been both the child and father of US Presidents. His father William Henry Harrison was the ninth President and holds the record for the shortest tenure, having died of pneumonia on the 32nd day of his presidency. John Scott’s son Benjamin Harrison was the 23rd President, serving one full term from 1889 to 1893. The Honorable John Scott Harrison was a Congressman from Ohio, a gentleman farmer, a family man and a highly respected member of his community, but if he is remembered at all today, it is for what happened to him after his death, a true tale of horror that caused a nation-wide sensation. 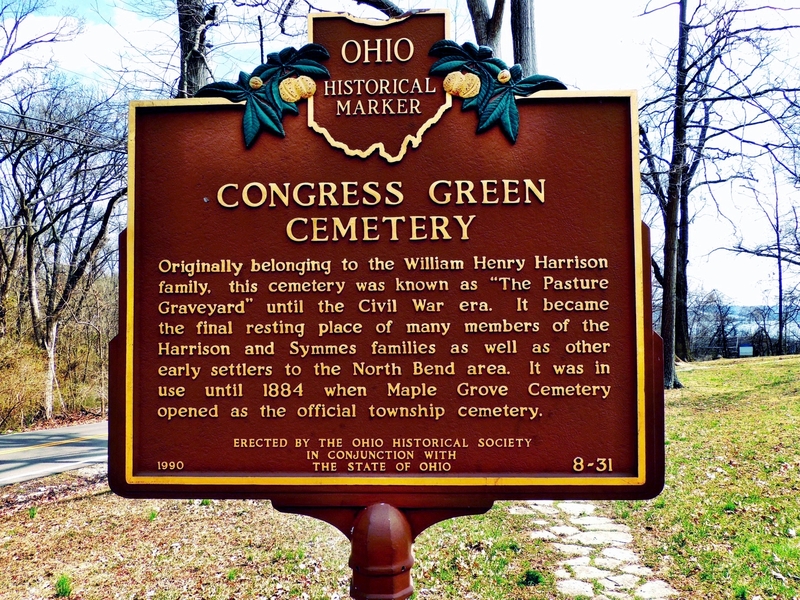 After a peaceful death in his bed at Point Farm the night of May 25th, 1878, John Scott Harrison was buried in the family plot overlooking the Ohio River Valley in Congress Green Cemetery, North Bend, Ohio. The funeral took place on May 29th. As family and friends walked to the grave for the burial service, they were dismayed to see that the still-fresh grave of their kinsman Augustus Devin had been disturbed. John Scott’s daughter Sarah was married to Augustus’ uncle Thomas Jefferson Devin, and the families were very close. In fact, John Scott had visited Augustus two weeks before the 23-year-old died of tuberculosis, only to unexpectedly follow him to the grave just a week later. At first the funeral party thought wild hogs might be responsible for the churned-up soil at Augustus Devin’s grave, but upon closer inspection they found the young man’s body was gone, stolen by body-snatchers, the reviled resurrection men who made their living by trafficking the dead. Horrified by this discovery and concerned that their father might suffer a similar indignity, Benjamin and his brothers John and Carter took additional measures to secure his final resting place. The grave was already brick vaulted with a thick stone bottom. They placed three large, heavy stone slabs eight inches thick on top of the metal casket — the largest at the head and the two smaller ones at the foot — and poured cement over them to create a solid block weighing nearly a ton. The grave was kept open for several hours until the cement dried. It was then filled and the family paid a watchman a dollar a night to guard the grave for 30 nights. 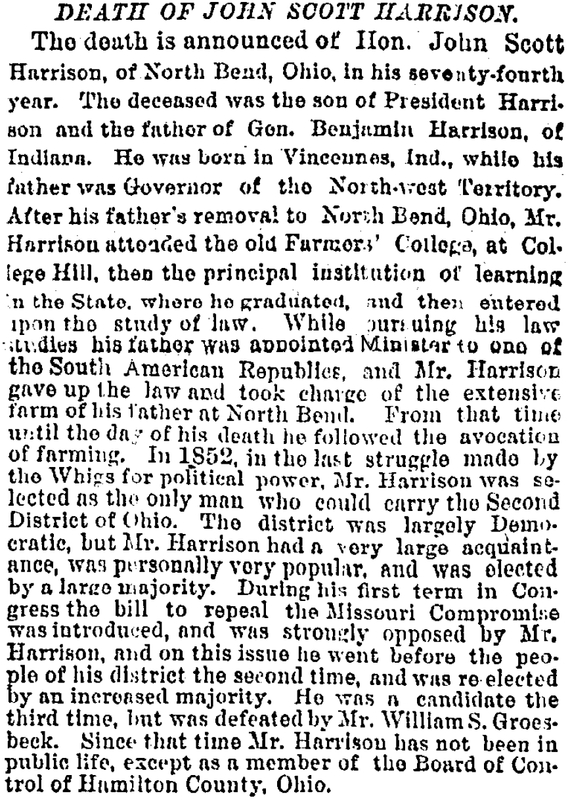 Having seen his father safely to his eternal repose, Benjamin Harrison, a distinguished attorney and already a prominent figure in the Republican party, returned to his home in Indianapolis to prepare for a speech he was giving at the Republican State Convention on June 5th. Benjamin’s youngest brother John Harrison went to Cincinnati with his nephew George Eaton to find and reclaim young Augustus’ body before the grieving mother had to be told it was gone. There was little question in their mind where the body had wound up. It was almost certainly sold to a local medical school, the primary receivers of stolen human flesh. While the Anatomy Act of 1832 had ended the illicit cadaver trade in the UK by supplying anatomy schools with bodies of unclaimed indigents, the federal system in the United States left that kind of legislation to individual states, and the notion of handing over the bodies of the poor for dissection offended American religious and moral sensibilities so much that few states made such provisions. 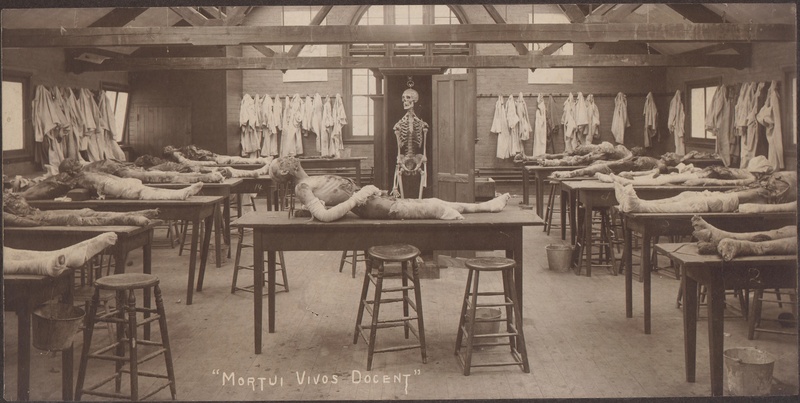 This combined with the explosion of new medical schools in the mid-19th century (in 1800 there were 4 medical schools in the whole country; by 1876 there were 73; by the end of the century there were dozens more) to create a massive demand for anatomical “materiel” that the resurrection men were only too glad to fill. 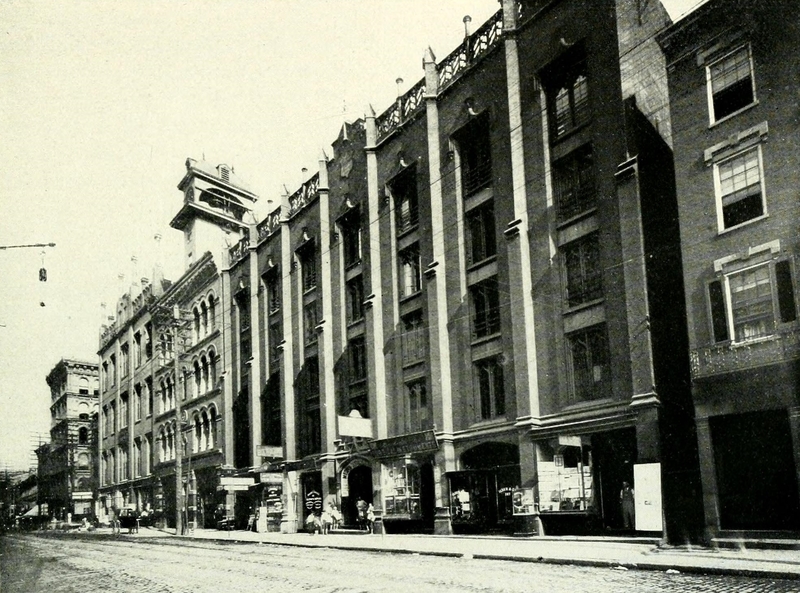 About three o’clock this morning, a sensation was created on Vine street by a buggy being driven into the alley north of the Grand Opera house. It proceeded about half way through to Race street, when something white was taken out and disappeared. Several men started in to see what was going on, when the buggy drove out to Race street and left rapidly. The general impression was that a “stiff” was being smuggled into the Ohio Medical College. 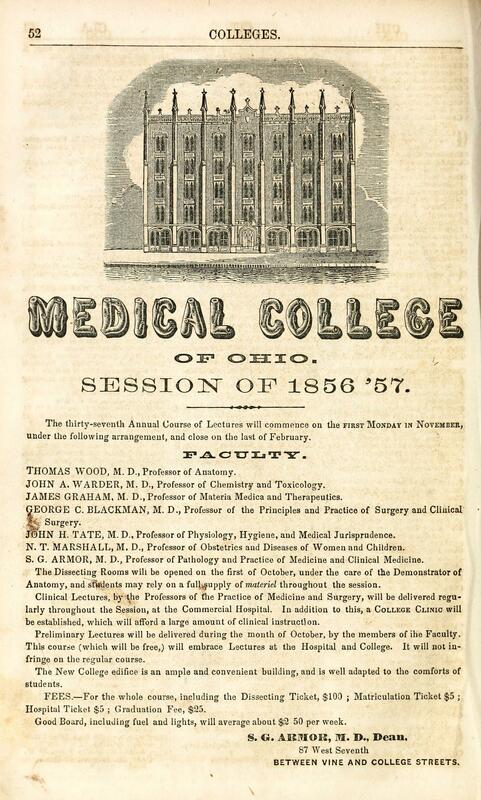 This small blurb and the outrage to a well-connected family with legal clout was sufficient for John Harrison and George Eaton to secure a search warrant that very day for the Medical College of Ohio. Armed with the warrant, Harrison and Eaton, accompanied by former Cincinnati Chief of Police Colonel Thomas E. Snelbaker, Constable Lacey and Deputy Constable Tallen of the Cincinnati police, went to the college and insisted on searching the premises. They were accompanied by the very apprehensive janitor, A.Q. Marshall, who protested that the officers of the college should be present before they turned the place upside down. The party proceeded to search every room on all five floors of the building, from cellar to garret. In the cellar they found a chute that opened onto the alley between Vine and Race Streets where the buggy had been seen dumping a suspicious white bundle at 3:00 o’clock that morning. This was how the resurrectionists surreptitiously delivered cadavers to the medical school. No need for daylight transactions that might raise awkward questions; no need for the faculty to interact with the grave-robbers in the presence of the evidence of their crimes. Another chute, this one running vertically from the cellar to the top of the building, was connected to it. The search party looked into both chutes, illuminating the darkness with their lamps, but saw nothing. Most of the rooms upstairs were empty too, though they searched every lumber pile, box and closet. Then they came upon a dissection room. A student was using it for its intended purposes, cutting into a partial body — the head and chest of a black woman — merrily slicing away at the already putrefying flesh. Walking briskly past this macabre scene, they found a box of assorted limbs cut from cadavers and kept for later use. Mixed in with the arms and legs was the intact body of a six-month-old baby. Disgusted and disturbed, they moved on to the top floor of the building. By this time, the police had allowed the janitor to leave, ostensibly to notify the school officers of the search, but Colonel Snelbaker was smart enough to have him followed. Instead of running off to alert the faculty, Mr. Marshall went upstairs to a room at the southeast corner of the building. He realized he was being shadowed so he turned around before entering, but it was too late. The cops now knew there was something worth hiding in that room. John Harrison, George Eaton and the three police officers entered the suspicious room, finding boxes, a few bones, papers and assorted junk. In a corner of the room near a window was a windlass. A rope ran from it into a square hole in the floor, presumably reaching the bottom of the long chute in the cellar. This is how the bodies were moved from the cellar to the dissection rooms: they were tied to a rope and lifted by the windlass at the top of chute. Snelbaker saw that the rope was taut as if something heavy was tied to it. He turned the windlass and slowly the body of a man emerged from the hole, the rope tied around his neck and under one arm. He was naked except for a tattered shirt and a cloth covering his head. John realized before the face was revealed that it could not be his cousin Augustus. The body was that of an old man in comparatively good health, not of a youth emaciated by the ravages of consumption. He was about to walk away when Snelbaker urged him to check, just in case. They pulled the body into the room and laid it on the floor. Blood trickled from a loosely stitched neck incision, forced out by the pressure of the rope. Slowly and somberly, Snelbaker loosened the rope around his neck so the cloth covering his face could be lifted. Harrison had been right; it wasn’t the body of Augustus Devin. Under the cloth was the face of an elderly man, discolored and bruised from the rope and careless treatment at the hands of the resurrection men. He had short white hair and a snow-white beard cropped an inch below his chin. John Harrison staggered, suddenly weak at the knees. “It’s father,” he rasped, and collapsed to the floor. 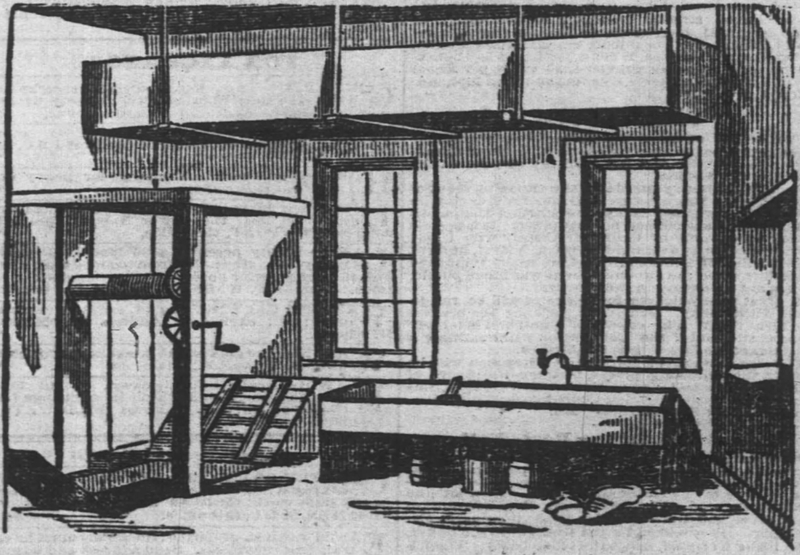 The body of the Honorable John Scott Harrison, buried in a cement-reinforced bricked vault less than 24 hours earlier, had been stolen from the grave, stripped of his clothing, shorn of his distinctive waist-length beard, and dangled from a rope in the cadaver chute of a medical school. I won’t be posting a full article today because I’m working on a special Halloween treat for all you boys and girls. For the first time in The History Blog history, I am writing a multi-part story. It is a macabre tale full of chills, thrills and shocking twists that wouldn’t be out of place in a Hammer Horror movie, only it’s all true. The first part will go live (or is it? ) at the stroke of midnight tonight. 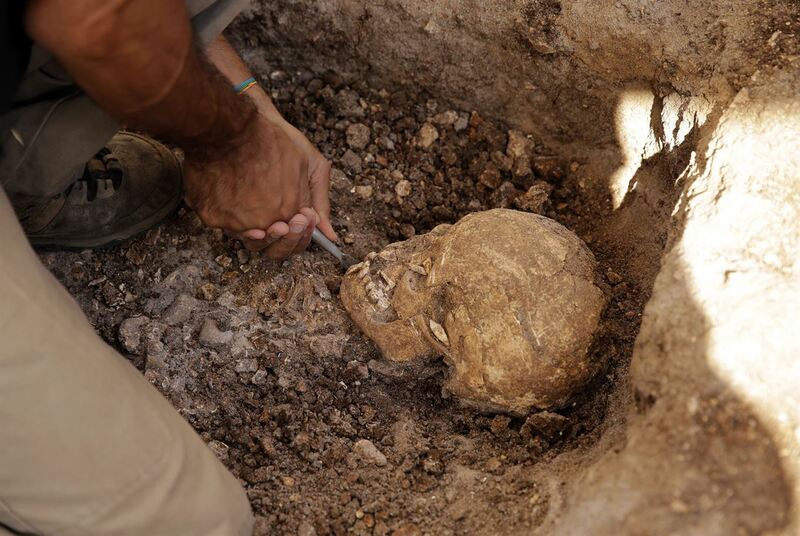 An archaeological survey in advance of new construction in the city of Batroun, about 20 miles north of Byblos on the Mediterranean coast of northern Lebanon, has unearthed an ancient burial ground. 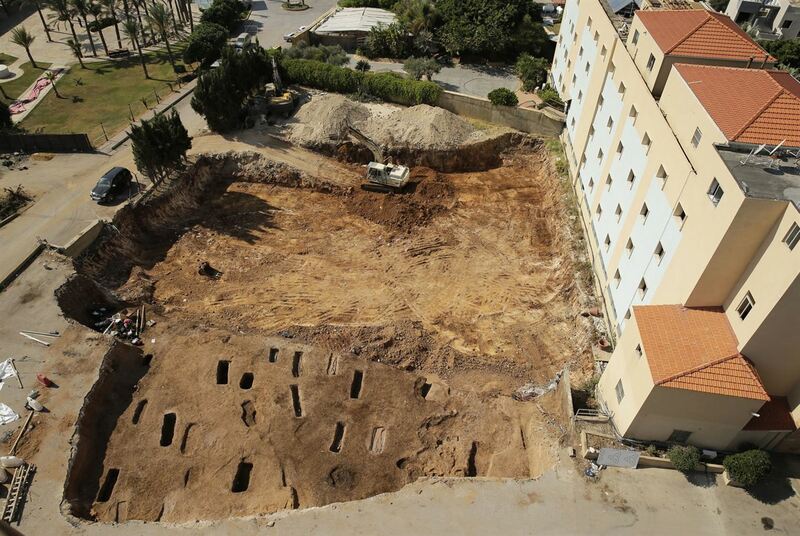 Archaeologists from Lebanon’s Directorate General of Antiquities (DGA) found 17 graves with skeletal remains at the site of a planned addition to the San Stephano Resort. 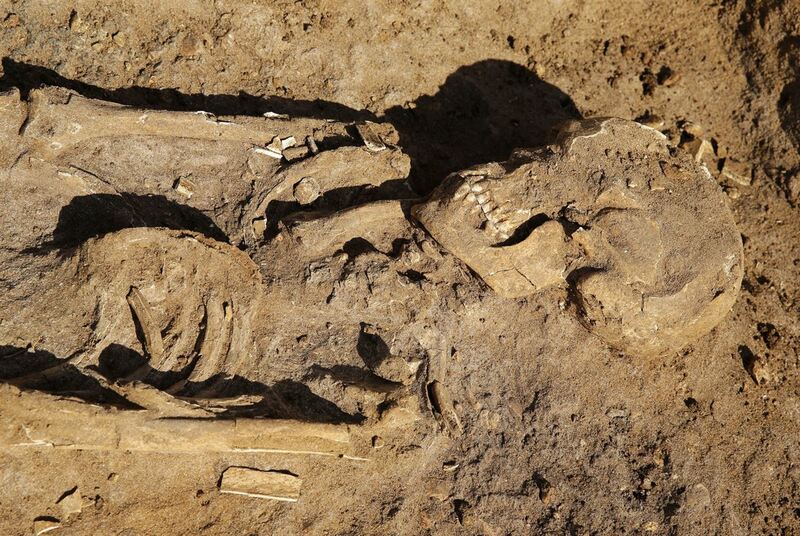 Initial osteological examination found the remains of men, women and children. Preliminary estimates date the graveyard to the 2nd or 3rd century A.D., a period when the city prospered under Roman rule. 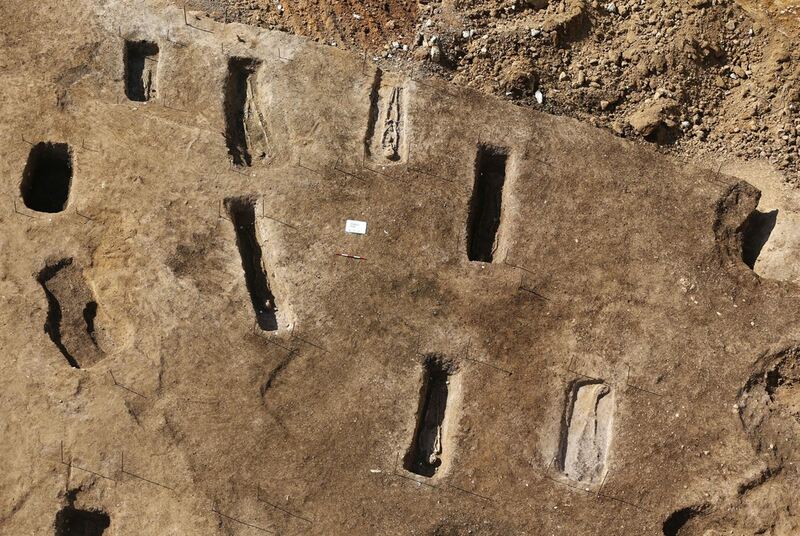 These estimates are based mainly on the type of interrals: coffin burials. The wood has not survived, but the coffin nails have. There are few grave goods — a coin, an iron ring and two modest pieces of Greek pottery from the Hellenistic period — but nothing clearly datable to the Roman period. A Roman-era necropolis was found nearby during construction of the main road, so this may be a continuation of the same burial ground. 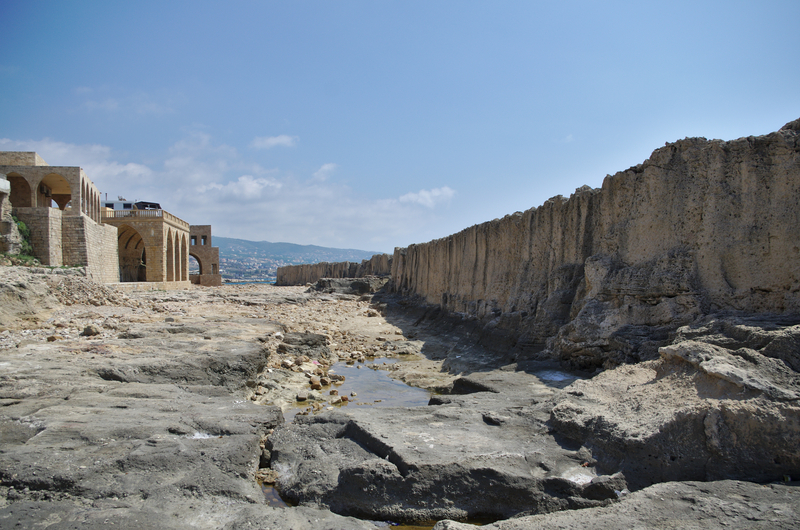 Batroun is one of the most ancient cities in the world, although the date of its founding is ambiguous. Ancient sources appear to differ on the matter, and it’s hard to pin down because the name of the town changes. The city of “Batruna” is mentioned by Rib-Hadda, the king of Gubla (Byblos to the Greeks), in EA 79 of the Amarna letters, a collection of diplomatic correspondence to Pharaoh Akhenaten incised on clay tablets in the 14th century B.C. ; some scholars believe this Batruna is Batroun. However, 2nd century B.C. Greek historian Menander of Ephesus is quoted in Flavius Josephus’s Antiquities of the Jews (Book VIII, 13, 2) saying “the city Botrys in Phoenicia” was founded by Ithobaal I of Tyre, the 9th century B.C. Phoenician king whose daughter Jezebel became infamous thanks to the Biblical account of her marriage to Ahab. The Greek name for Batroun is Botrys, Bothrys or Bostrys. As the Rib-Hadda was appealing to Akhenaten for military aid against the nomadic Apiru or Habiru people who were in league with his enemy Abdi-Ashirta, the Amorite king of Amurru, it’s possible that Amarna-period city of Batruna was sacked and then refounded by Ithobaal in the 9th century. It was subsequently conquered by the Assyrians, Alexander the Great, the Arab Iturean tribes and the Romans. It was part of the Greek Orthodox Patriarchate of Antioch when on July 9th, 551 A.D., it was all but destroyed by a massive earthquake that levelled many Levantine cities. It reappears in the historical record in the 12th century when Crusaders took it from the Emirate of Banu Ammar. Whatever the exact date of its founding and gaps in occupation, Batroun is one of the most ancient cities in the world. It has notable archaeological remains from the Phoenician, Hellenistic, Roman and Crusader periods, including a protective sea wall the Phoenicians built by adding masonry to a natural formation of petrified sand dunes. The wall is 740 feet long, the longest Phoenician structure still in existence, and is up to 16 feet high in parts. Roman remains include a rock-cut theater which is on private property but is open to the public and irrigation channels, some of which have been integrated into the modern canal system. 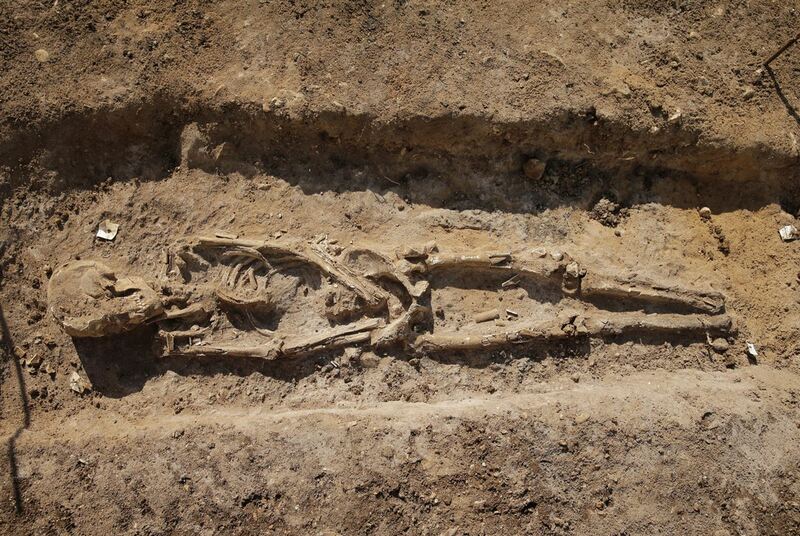 The earthquake claimed a great deal of the Roman city, so the discovery of the burial ground is highly significant. The remains will be removed to the Directorate General of Antiquities in Beirut for further analysis and study. Radiocarbon dating should confirm the date of this necropolis. The Orkney Islands at the northern tip of Scotland have a uniquely rich archaeological patrimony going back 8,500 years to the Mesolithic era. Because the coastal areas of the archipelago are highly susceptible to erosion, particularly in the winter when storms and tides batter them mercilessly, archaeologists keep a sharp eye out for any artifacts or remains that may have been exposed by erosion. That’s what Dr. Hugo Anderson-Whymark was doing on the East Mainland coast when he discovered a stone slab jutting out of the cliff face. He saw that it wasn’t a natural stone, but had been shaped and carved with designs. Much of the carved surface was obscured by its position in the cliff. 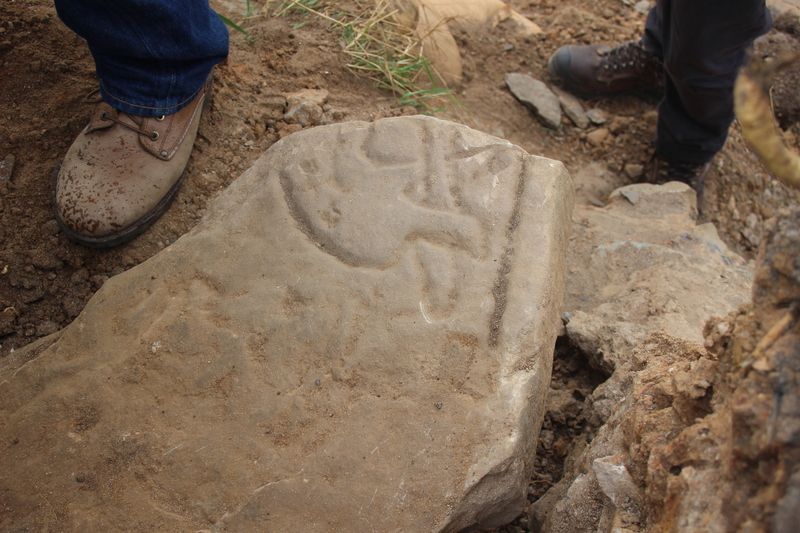 Dr. Anderson-Whymark was able to see part of the carving, a beast or dragon in an S-shape that is characteristic of Pictish design from the 3rd to the 8th centuries. Because more storms were expected within days, the stone had to be recovered as quickly as possible or risk literally falling off a cliff. 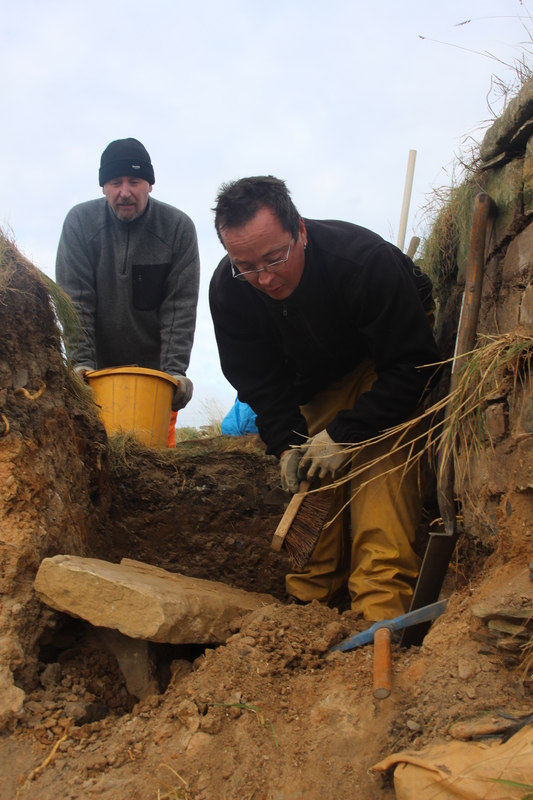 The Orkney Research Centre for Archaeology (ORCA), with the aid of Historic Environment Scotland which provided funding for the excavation and conservation of the artifact, sent a team to excavate the slab. Once it was removed, experts identified it as a Pictish cross slab from the 8th century. The stone, 2.8 feet long by 1.8 feet wide and 3.6 inches thick, is incomplete and weathered, but an intricately carved cross stood out on the front face with the dragon/beast at its side. The rear face, even more weathered than the front, featured another beast with what looks like a beak holding a staff. Nick Card, senior projects manager at the University of the Highlands and Islands Archaeology Institute’s Orca, said: “Carved Pictish cross slabs are rare across Scotland with only two having been discovered in Orkney. Once the stone is cleaned and conserved, ORCA hopes to put it on public display. Dr. Hugo Anderson-Whymark scanned both sides of the cross slab as soon as it was free and clear, before it was cleaned. Here’s the 3D model created from the scan. Founded in the 859 A.D. by Fatima al-Fihri, the daughter of a wealthy merchant who was herself highly educated and who dedicated her considerable inheritance to the creation of a mosque and school in her community, the University of Qarawiyyin in Fes, Morocco, is the oldest degree-granting institution in the world. 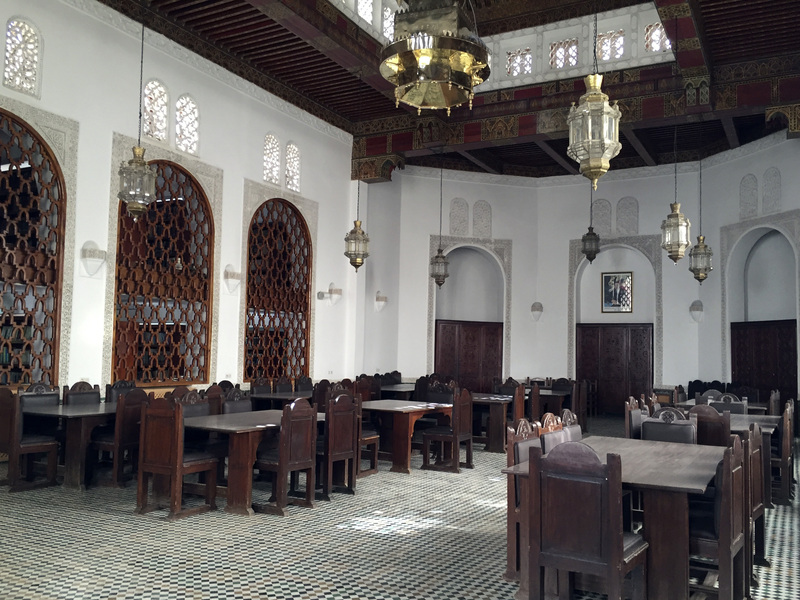 The Al-Qarawiyyin library has been in continuous operation since the 10th century and is believed to be the oldest library in the world. 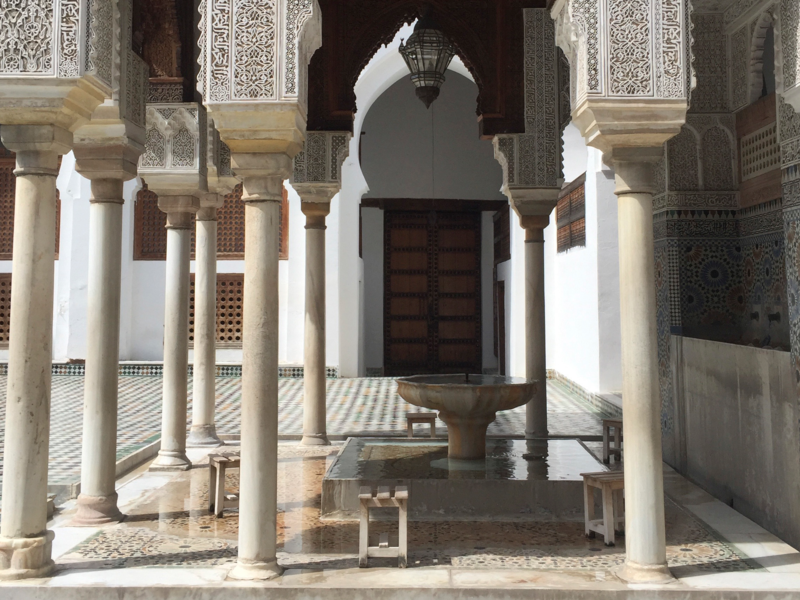 After years of neglect, the library is undergoing extensive renovation as part of a renewal program that will restore the Medina, Fes’ walled pedestrian historic district built in the late 8th, early 9th century. In a fitting tribute to its founder, the person in charge of the restoration is a woman, Canadian-Moroccan architect Aziza Chaouni. 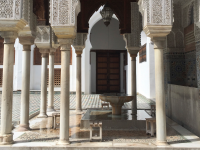 Inside the library are ornately carved wooden window frames and archways, colorful ceramic tile designs on the floors and elegant Arabic calligraphy engraved in the walls. The high ceilings in the reading room are adorned with gold chandeliers. The library is replete with extremely rare, some unique, volumes. 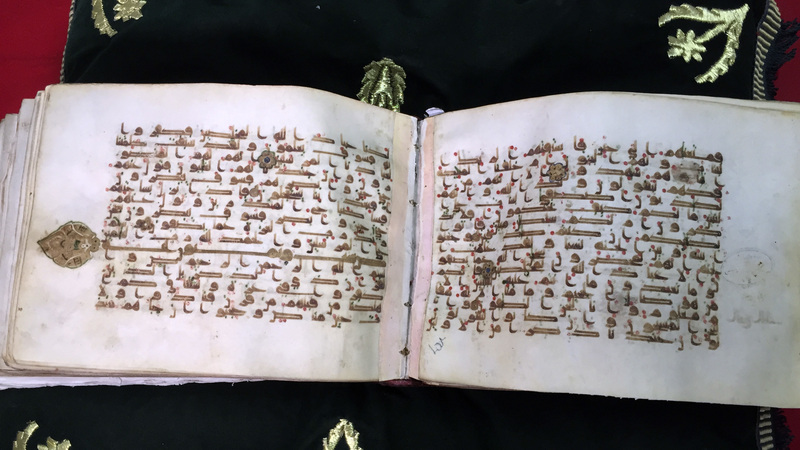 There are more than 4,000 manuscripts in its collection, including a 9th century Quran written in beautiful Kufic script on camel skin, the earliest known Islamic hadiths, and an original manuscript of the Mukkadimah, a universal history written in 1377 by philosopher Ibn Khaldun which many scholars hold to be the first exploration of fields we know as sociology, historiography, demography and other social sciences. It’s particularly meaningful to have a book written in his hand, because after university he began his career as a calligrapher for the Chancellery in Tunis. When he moved to Fez shortly thereafter, he got a job writing royal proclamations for the Sultan. “When you read a book, you travel in history. When you see a manuscript that is nearly ten or more centuries old, you travel in time. As I said, the library gives you a spiritual bond for these and other reasons. Since I arrived at Al Qarawiyyin Library, it never crossed my mind that I would leave it,” said deputy curator Abou Bakr Jaouane. These priceless texts need conservation as well. Some have been damaged by the moisture and decay plaguing the building itself. Now that the restoration of the structure is almost complete with new gutters, solar panels and air conditioning, the manuscripts finally have a room suited to their preservation. It is climate controlled with a custom temperature and humidity settings as well as a state-of-the-art security system. The restored library also has a new laboratory for the treatment and conservation of its historic manuscripts. The library will reopen to the public in May 2017. Last Monday, the Smithsonian’s National Museum of American History launched a crowdfunding campaign to raise $300,000 for the conservation and display of the Ruby Slippers famously worn by Judy Garland as Dorothy in the 1939 film classic The Wizard of Oz. 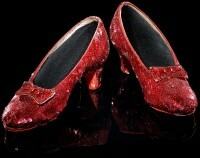 The Smithsonian’s budget is sufficient to keep the Ruby Slippers relatively stable in their current condition, but they turned to Kickstarter for the money to conserve the shoes and create a custom state-of-the-art display case with light, temperature and humidity controls that will ensure the long-term preservation of one of the museum’s most iconic film artifacts. The money raised would go to repairing what could be repaired (without ruining the original evidence of use because that is an important part of their history), but also towards researching how best to approach the conservation of materials like the sequin coating about which we know very little. That is essential to ensuring that the new display case is properly set to keep the Ruby Slippers in ideal conservation conditions. The response was to the campaign was huge and immediate. The goal was met and exceeded within a week, thanks to donations from more than 5,000 people from 41 countries on every inhabited continent. With another 21 days to go, the Smithsonian has added a stretch goal of $85,000 for the conservation and display of the patchwork Scarecrow costume worn by Ray Bolger in the movie. The Scarecrow will need a full conservation assessment to determine which materials were used to construct the costume. This will include working with scientists to identify the materials and conducting historical research. We will take a close look at the textiles and dyes that are extremely sensitive to light and wear. We need to understand what condition they are in to determine what treatment will best conserve and preserve them. Once those issues are addressed, we can decide how best to display the costume. The Scarecrow costume will need an internal structure to support the textiles and reduce stress so that he will remain in good condition far into the future. 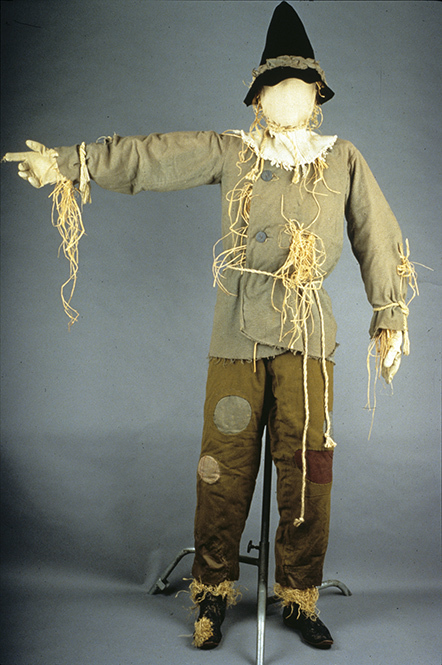 As the Scarecrow is less glamorous than the Ruby Slippers, so far only $17,000 of the $85,000 has been raised, but we all know that if he didn’t get restuffed and spruced up so he could join the Ruby Slippers in a new exhibition gallery in 2018, Dorothy would miss him most of all. 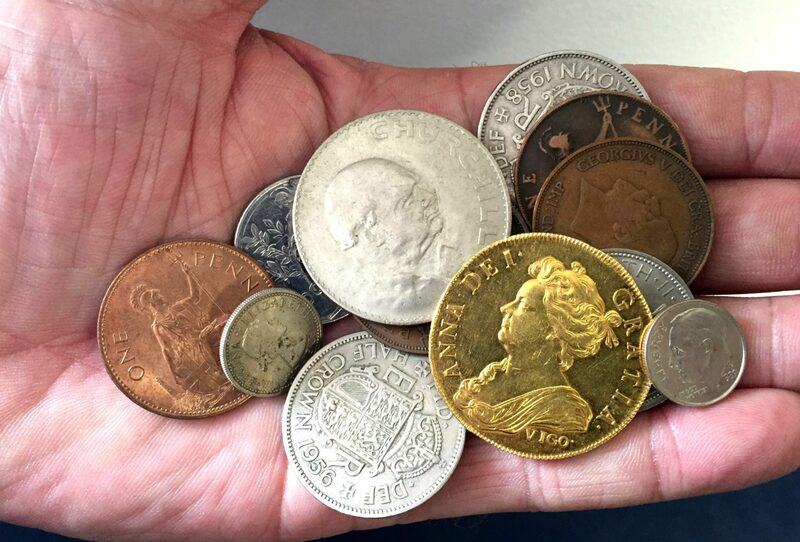 A gold coin in a toy box that figured in the pirate games of two generations of young boys turns out to be one of the rarest British coins, a bona fide treasure. The owner, who chooses to remain anonymous because he basically hit the lottery, was given the coin by his grandfather. Before letting his son go fully to town on the coins, he brought them to Essex auction house Boningtons to see if any of them were worth something. 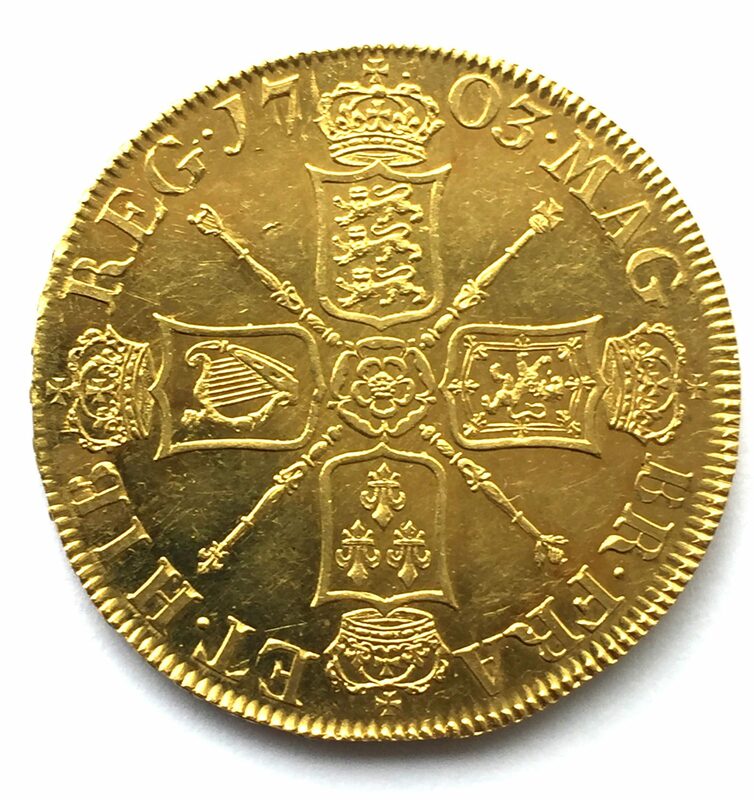 Coin expert Gregory Tong recognized it as one of Britain’s rarest coins: a 1703 Queen Anne ‘Vigo’ five-guinea gold coin, made from gold taken from Spanish treasure galleons at the Battle of Vigo Bay in October 1702. It was the early days of the War of Spanish Succession, when the last decrepit, inbred Hapsburg king of Spain died putting the Bourbon Philip V, son of Louis XIV of France, on the throne and threatening the Balance of Power in Europe. 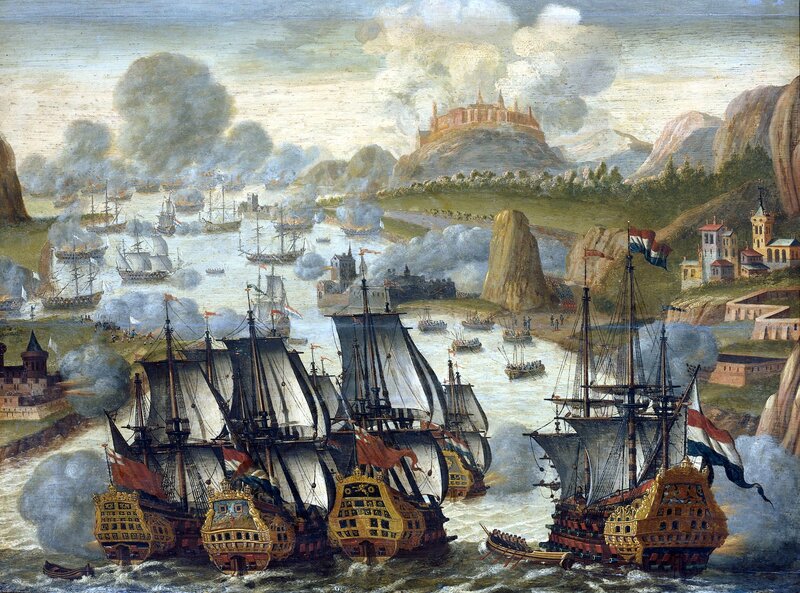 The allied fleets of Britain and the Dutch Republic had attempted to capture the port of Cádiz at the end of August 1702, hoping to gain a base in the Mediterranean for their ships and to cripple Spain’s access to the wealth of its New World colonies. The attempt was a disastrous failure. Craft and ships were lost in the landing, troops pillaged port towns and never even got to Cádiz itself. As September came and no progress was made, bad weather became an issue. On September 30th, the Allied fleet left with its proverbial tail between its legs. The Cádiz debacle did have one useful consequence for the Allies: the Spanish silver fleet which usually landed at Cádiz was forced to dock at Vigo Bay in Galicia. Lacking the complex customs and trade infrastructure required to process the tons of silver and gold, the Spanish treasure ships and the French fleet protecting were locked into the bay for a month. The English command got wind of this as its ships were heading back to England, and figured they might at least make lemonade out of the Cádiz lemons by attacking the treasure ships. On October 22nd, the Anglo-Dutch fleet entered Vigo Bay. The next day, they engaged the Spanish and French fleet. It was a total rout. Every single Spanish and French ship was either captured or burned. More than 2,000 men died on the Spanish-French side. Only 200 were lost on the Allied side. While most of the silver had already been unloaded from the treasure ships, the Allies did manage to score thousands of pounds of silver and a much smaller amount of gold. The gold was used to make half-guinea, guinea and five-guinea coins. 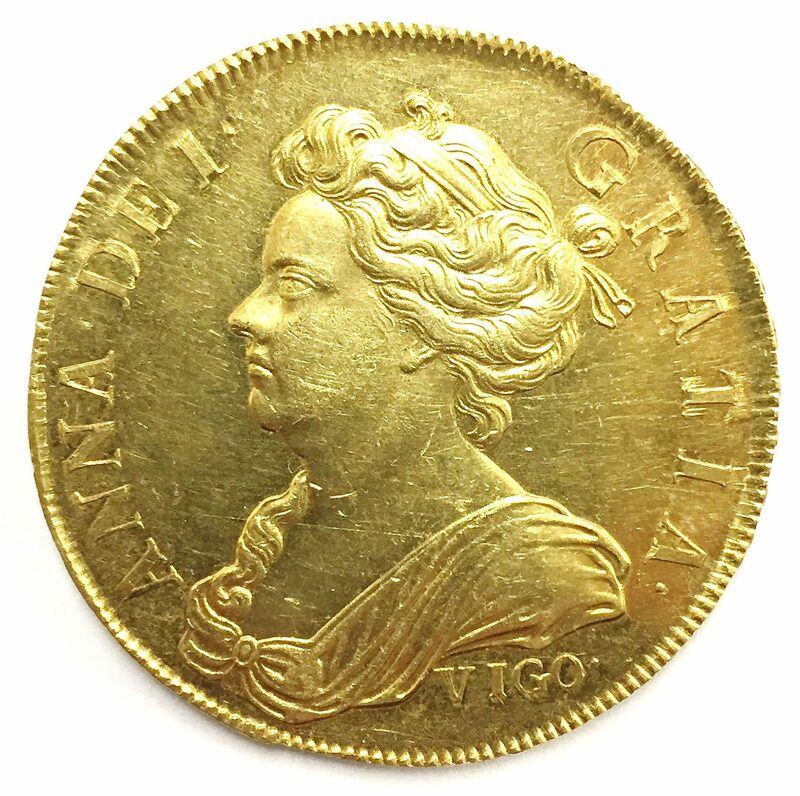 They bore the dignified profile of Queen Anne on the obverse with the word VIGO stamped under her shoulder to publicize the source of the gold. On the reverse was the pre-union coat of arms. Only 20 of the five-guinea pieces are believed to have been struck. The Vigo coins were meant to be circulated — the silver was made into crown, half-crown, shilling and six-penny pieces — but the gold five guinea coins were so expensive that only the very wealthiest people could afford them, and they weren’t likely to spend them like cash. Of the 20 struck, only 15 of them are known, all of them in private collections. They very seldom come up for auction. Only six of them have gone on the market in the last 50 years. The estimated value of the toy box coin is £200,000-250,000 ($243,620-$304,525), but it could easily sell for more given its rarity. The last Vigo coin to sell at auction went for just under £296,160 ($360,200) and that was in 2012. 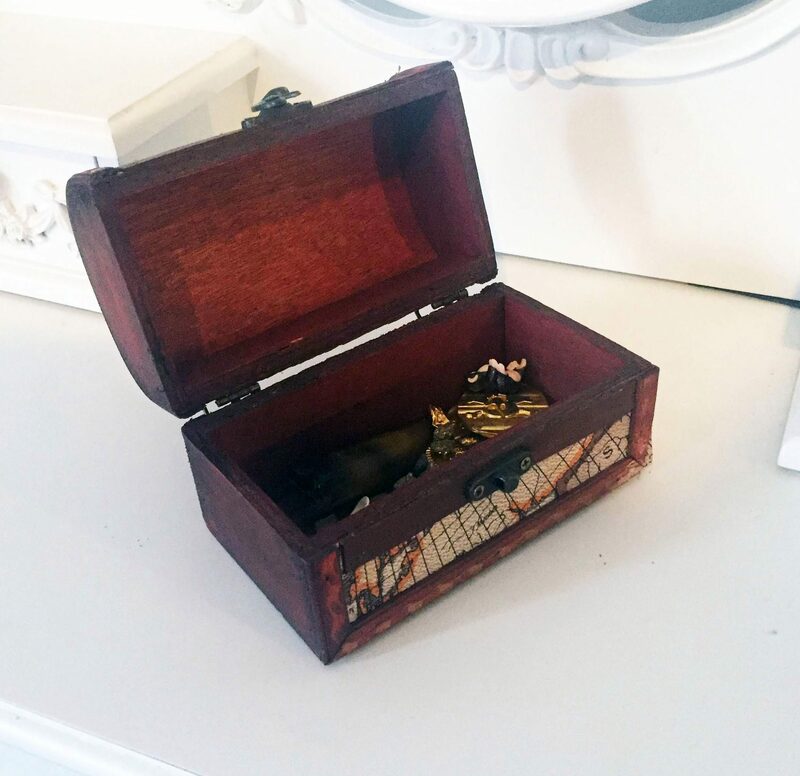 When the owner discovered that the coin he’d played pirate treasure with was an actual treasure, he closed himself in the car and exulted so vigorously that the auction house staff could see the car bouncing as it was parked. He even came back the next day to be sure he wasn’t getting punked. The coin goes on the auction block at Boningtons’ Epping saleroom on Wednesday November 16th. 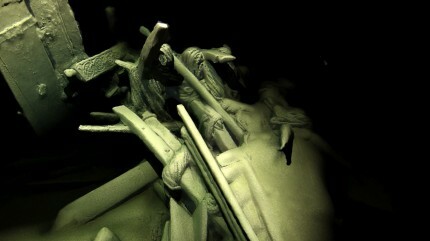 The Black Sea Maritime Archeology Project wasn’t looking for shipwrecks. Its brief is to survey the Bulgarian coast of the Black Sea for data about the rise water levels after the last Ice Age 20,000 years ago. 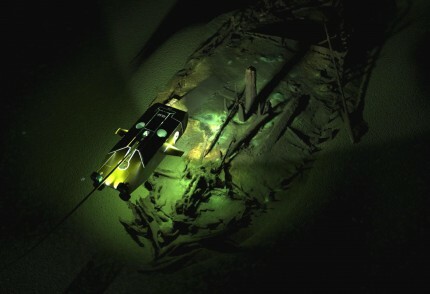 To accomplish this aim, marine archaeologists have been scanning the seabed using cutting edge Remotely Operated Vehicles that can detect land surfaces underneath what is now the Black Sea but in prehistory were on dry land. They’ve also taken core samples, laser scanned and filmed the sea bed both in video and with high resolution 3D photogrammetry. 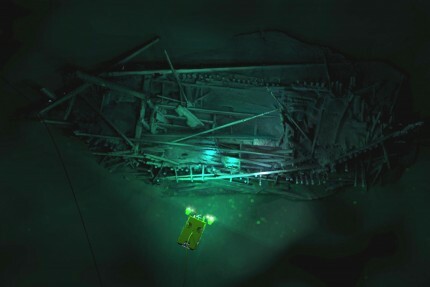 One of the two Black Sea MAP ROVs has broken records for depth (1,800 meters or 5,905 feet) and speed (over six knots) and was able to survey 1,250 km (777 miles), recording everything with its path using a full panoply of geophysical instrumentation, high definition cameras and a laser scanner. 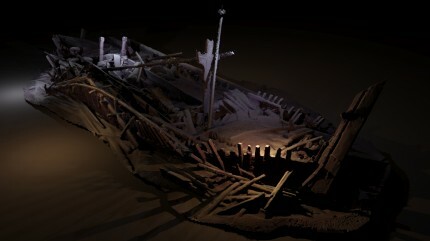 A felicitous but entirely unplanned side-effect of this exceptionally thorough geophysical survey is the discovery of more than 40 historic shipwrecks, including ancient Byzantine, medieval and Ottoman ships. 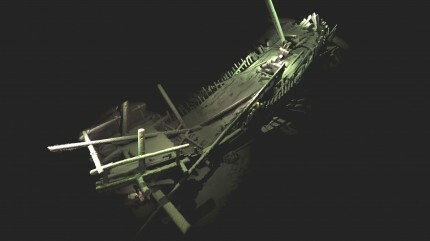 Some of them may even be the first of their kind ever found, previously known only from documentary sources. Such a large, varied group of shipwrecks from different periods will give archaeologists a whole new understanding of trade and maritime links between towns on the coast of the Black Sea. [University of Southampton professor and Principle Investigator on the Black Sea Maritime Archaeology Project Jon] Adams comments: “The wrecks are a complete bonus, but a fascinating discovery, found during the course of our extensive geophysical surveys. They are astonishingly preserved due to the anoxic conditions (absence of oxygen) of the Black Sea below 150 metres. The gun used by Symbolist poet Paul Verlaine to shoot his young lover and fellow poet Arthur Rimbaud will be sold at auction next month in Paris. This weapon featured in one of the great scandals of 19th century French literature, which, given the amount of drinking, drugging and sexing going on in that bohemian milieu, is an impressive feat. It was known as the Brussels Affair and was the dramatic dénouement of a tumultuous two-year relationship. 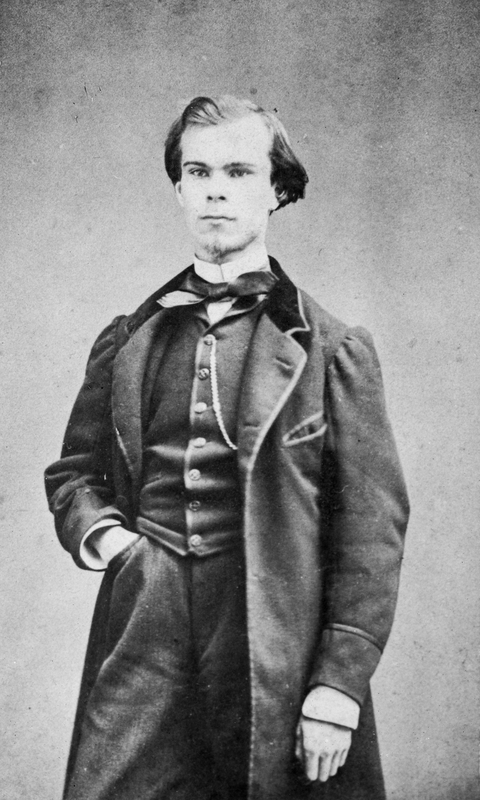 Born in Metz in 1844, Paul Verlaine was the only child of a successful career military officer. His mother had had three miscarriages before Paul was born (she apparently kept the miscarried fetuses in jars in the family home), so he was very much beloved. His teenaged years were troubled and he was sent to boarding school where his boredom and appreciation for Baudelaire inspired him to write his own poetry. After he graduated, he had few interests besides pursuing his poetry. 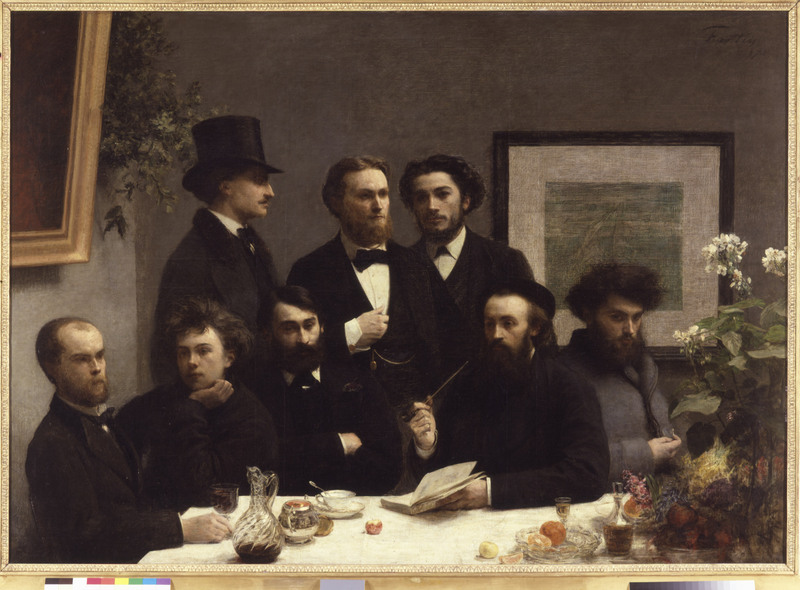 He enrolled in law school in 1862 but dropped out, preferring to hang with his artist friends in Paris. He published his first poem in a literary magazine in 1863. His father, hoping like so many parents of artists before and after him that he would get a “real job,” secured him employment at an insurance company, then at City Hall. Verlaine continued to write even as he worked his 9-5 jobs. In 1866, when he was 22, his first collection of poems, Poèmes saturniens, was published. It was well-received and established him as a significant new talent on the scene. His personal life, on the other hand, was a mess. He still lived at home with his parents. He drank to excess and was a brutally violent drunk. After his first love (his cousin who was raised by his parents after she was orphaned and wisely married someone else) died in childbirth in 1867, he tried to kill his mother several times in an alcoholic haze. At his mother’s vigorous encouragement, he got married in of August 1870 to Mathilde Mauté. He was 26; she was 17. They moved to Paris where, as a supporter of the Paris Commune, he enlisted in the National Guard and patrolled the streets of a quiet neighborhood every other night. When the Commune fell in May 1871, Verlaine fled the repression of the Communards. He was back in the city by September which is when he met Arthur Rimbaud for the first time. Rimbaud was a fan of Verlaine’s poetry and had sent him several letters included poems of his own. In January of 1872, Verlaine invited the 17-year-old to moved in with him and Mathilde, an arrangement which was fraught with tension. There was a newborn in the house — Mathilde had given birth to their son Georges in October of 1871 — and Verlaine’s relationship with the teenaged poet quickly developed into a tempestuous sexual and emotional affair. Meanwhile, his alcoholism and violence increased. He beat Mathilde whenever he drank, threatened to kill her, even hit their infant son, once throwing him against a wall. She took the baby and left. Their affair went public after that. Rimbaud was rude, shameless and just as much of an addict as Verlaine. They collaborated on poetry, drank absinthe by the keg, smoked opium and fought like wolverines, scandalizing even their circle of poets and intellectuals. After a desultory attempt to win back Mathilde by promising her he’d never see Arthur again, Verlaine left Paris with Rimbaud July of 1872 for Brussels. In September they moved on to London. There they spent almost a year off and on, fighting, drinking, breaking up, making up and generally being miserable with each other. Rimbaud tried to stab Verlaine. Verlaine called Rimbaud his “infernal spouse.” Rimbaud would write about this time in the aptly named A Season in Hell. In June 1873, Verlaine left for Brussels alone. He couldn’t last a month before writing to Rimbaud asking him to join him. Rimbaud went to Brussels, but told Verlaine he was going to Paris instead of staying with him. 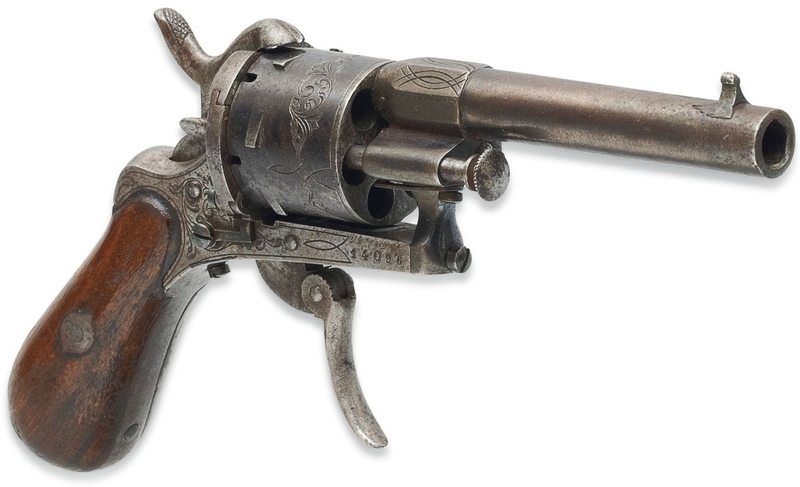 On the morning of July 10th, 1873, Verlaine bought a Lefaucheux 7mm six-shooter from the Montigny armory in Brussels. He wrote to his family and friends to inform them he planned suicide, spent the rest of the morning drinking, then returned to his room with Rimbaud. When the younger man announced he was leaving, Verlaine fired at him twice, intending murder. He barely wounded him, one bullet grazing his left wrist, the other ricocheting off the wall into the chimney. Rimbaud was treated for his wound at Saint-Jean Hospital then went straight to the train station to get out of Dodge. Verlaine was waiting for him. When he reached for his pocket, Rimbaud ran to the police who arrested Verlaine. Rimbaud withdraw his complaint the next day, Verlaine was tried for assault with pederasty as an aggravating factor. On August 8th, he was sentenced to two years in the prison of Petites Carmes. In October he was transferred to the prison in Mons. He was released early for good behavior after 555 days of incarceration on January 16th, 1875. The two saw each other one last time in 1885. 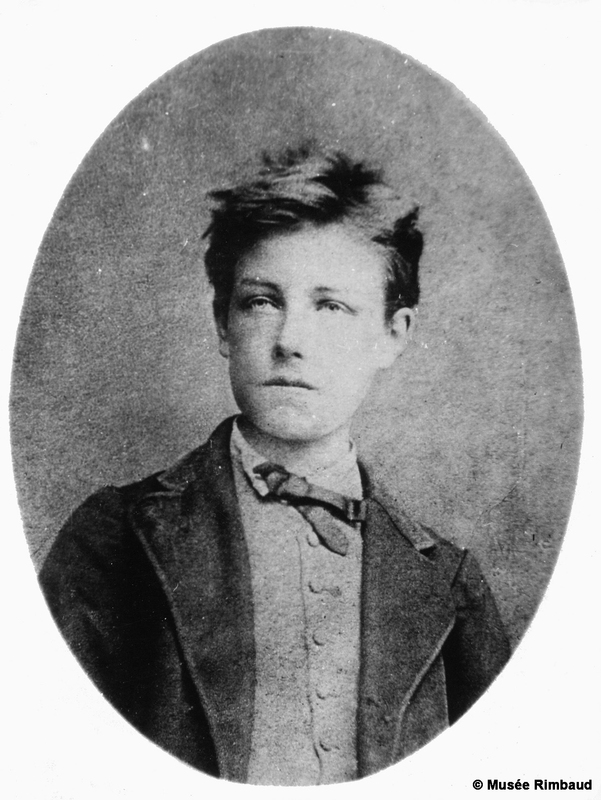 Rimbaud died of cancer six years later. He was 37. 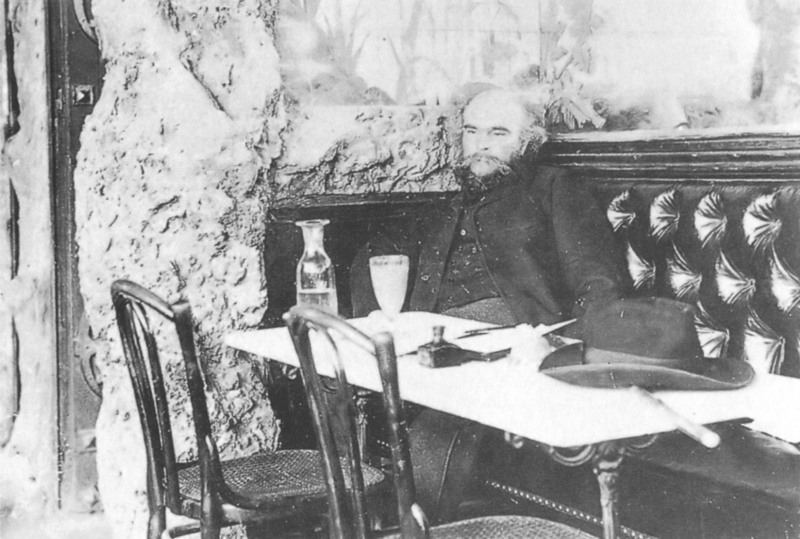 Verlaine died broke, drunk, diabetic and syphilitic in 1896 at the age of 51. He never thought to claim his revolver from the police. They sent it back to Montigny where it remained in their archives, unknown to the public, for close to a century. When the Montigny company filed for bankruptcy in the 1980s and had to liquidate all its inventory, the owner reached out to his good friend and weapons collector Jacques Ruth to buy some of their stock. In gratitude, he gave Ruth the revolver at the center of the notorious Brussels Affair. Ruth didn’t grasp its cultural significance at the time. He only realized what a scandalous treasure he had when he saw the 1995 film Total Eclipse starring David Thewlis as Verlaine and Leonardo DiCaprio as Rimbaud. In 2004, a new exhibition dedicated to the life and work of Paul Verlaine opened in Brussels. Ruth notified the curator that he had the famous revolver. The curator thought he was joking, but research confirmed that it was the real deal, serial number 14096, listed in the Montigny registry book as the one Verlaine bought on July 10th, 1873. It went on display for the first time at a 2015 exhibition on Verlaine held at the Mons prison where he did time. The Lefaucheux six-shooter #14096 goes on the auction block at The Exceptional Sale at Christie’s Paris on November 30th. The pre-sale estimate is €50,000-70,000 ($54,315-76,041). 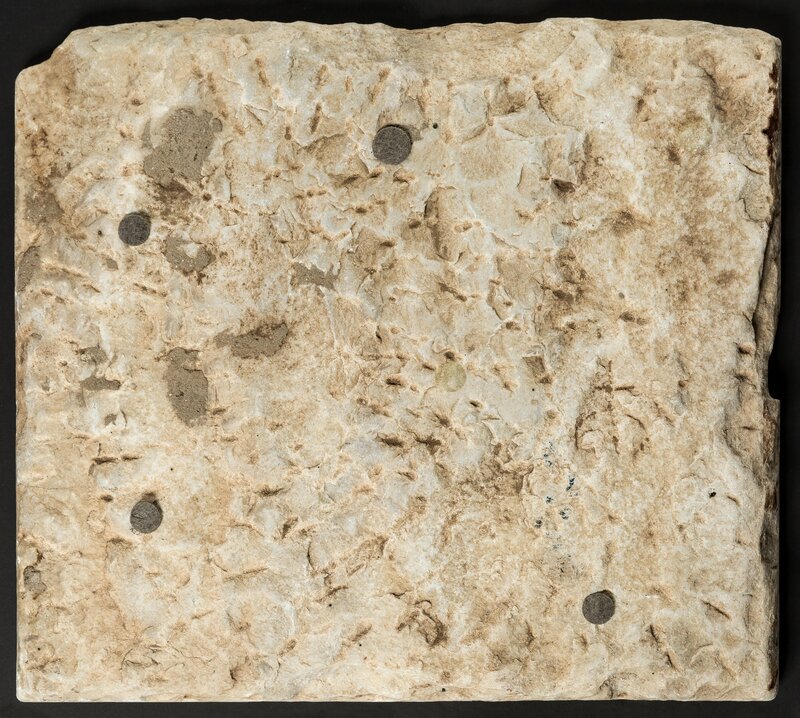 A marble tablet inscribed with the Ten Commandments in Samaritan will be sold at auction next month at at Heritage Auctions in Dallas. The Yavneh 10 Commandments Stone is roughly two-by-two feet, weighs 115 pounds and was carved probably between 4th and 8th centuries A.D. in the Samaritan variant of Paleo-Hebrew script. 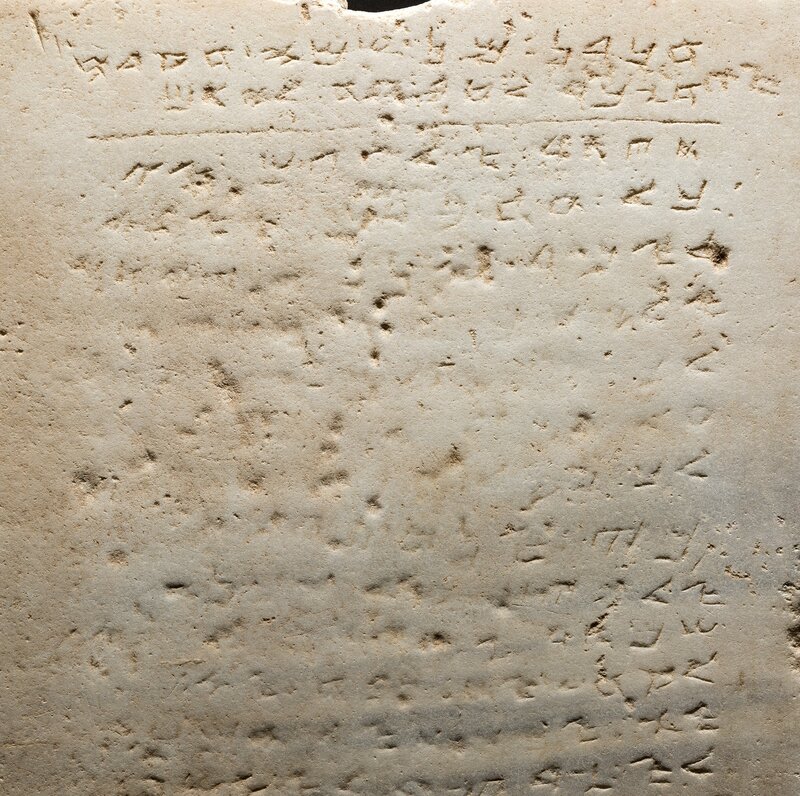 It is one of only five inscriptions of the Samaritan Decalogue from before the Muslim invasion known to survive. A close derivative of ancient Phoenician, Paleo-Hebrew script was in use from at least as early as the 10th century B.C. — the Zayit Stone, the oldest inscription in the Paleo-Hebrew alphabet, dates to then — until the 5th century B.C. when Aramaic began to take its place. The Samaritans, however, continued to use their version of Paleo-Hebrew and still do so today. You might notice they’re not quite the standard set of 10. The one about not taking the name of God in vain is missing, and there’s a new one at the end about building the temple on Mount Gerizim to house the tablets. The tablet’s origins are nebulous, but according to research done in the 1940s, it was discovered in 1913 by construction workers building a railroad near Yavneh on the southern coast of what was then Palestine. They either gave it or sold it to a wealthy local man who installed it on the floor of a doorway into his courtyard. Over time, the middle of the inscription was worn down be people walking on it, but it can still be read under oblique lighting. 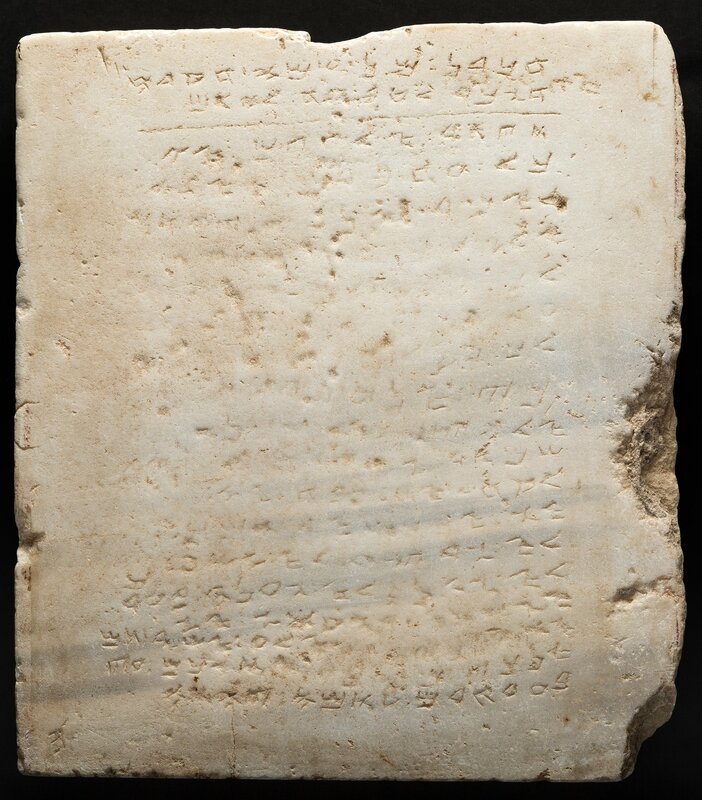 The son of the owner sold it in 1943 to Mr. Y. Kaplan who knew right away it was a rare Samaritan Decalogue tablet. Kaplan engaged scholar and expert in Samaritan history (and the future second President of Israel) Yitzhak Ben-Zvi to study the stone. It was he who determined its likely age range based on the writing style of the Samaritan. Later scholarship has expanded the possible date range to the early Islamic occupation period (ca. 640-830 A.D.), but the Byzantine date range is still prevalent. The stone was sold to an antiquities dealer in the 1990s and in 2005 was bought by Rabbi Saul Deutsch of the Living Torah Museum in Brooklyn, New York. 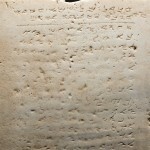 As an object of Israeli cultural patrimony, the tablet’s export required a special permit from the Israel Antiquities Authority who allowed it on the condition that it was to be put on public display. The museum has a collection of ancient artifacts that illustrate people, places and things mentioned in the Torah, like 3,500-year-old Hittite toy chariots as examples of what the Egyptian chariots that chased the fleeing Jews during the Exodus may have looked like. Judging from what’s available online at least, some of the connections are tenuous at best. Fragments of Coptic-era Egyptian garments, for instance, are hardly indicative of what the Jews who left Egypt might have worn. While the tablet has been on display since the sale, as per the terms of the agreement with the IAA, it is not one of the artifacts included in the website’s slideshows. The museum, which contains a large collection of artifacts of Jewish life and history dating back to antiquity, is shifting toward a more hands-on focus to attract younger visitors and decided it was time to sell the artifact. “The sale will provide us with the money to do what we need to do. It’s all for the best,” Deutsch said in a statement. The opening bid will be $250,000, a fortune for a small Brooklyn museum. One caveat, though, the condition requiring public display of the artifact still holds, so the buyer can’t just stash it in his cave of wonders. The auction is on November 16th, but you can bid online starting Friday, October 28th.